All of us, at some point in our lives, will be plagued to some degree by clutter. Whether it’s due to your cramped inner-city flat, your child’s most recent onslaught of birthday gifts, or your utter inability to throw anything away, the messiness and frustration is an all-too-common problem and one of the most common issues for which clients seek help from a designer. The bedroom is a natural breeding ground for clutter as it’s a personal space, hidden from general view, where you can get away with leaving things laying about and let them pile up until you’re up to your eyeballs in unidentifiable, suffocating STUFF. 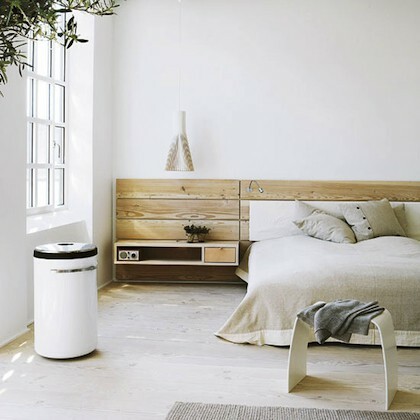 One way to start conquering this perennial problem is to invest in a bed or bed accessories that make use of precious space that often goes to waste. You can tuck nifty compartments and organizational infrastructure into spaces that previously contained only dust bunnies and those random shoes you never wear. I like these pretty wicker ones. I’m pretty sure this bed is custom-built, but if you’ve discovered the source please do let us know in a comment! This one from John Lewis is really sleek in design, and even has a nifty slide-out night table with a bookshelf. The walnut colour is lovely and contemporary. 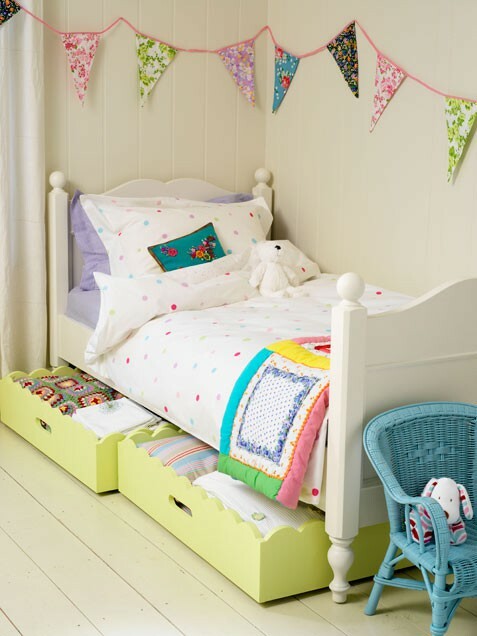 These painted trays on casters are super cute and easy to roll out from under a little one’s bed. 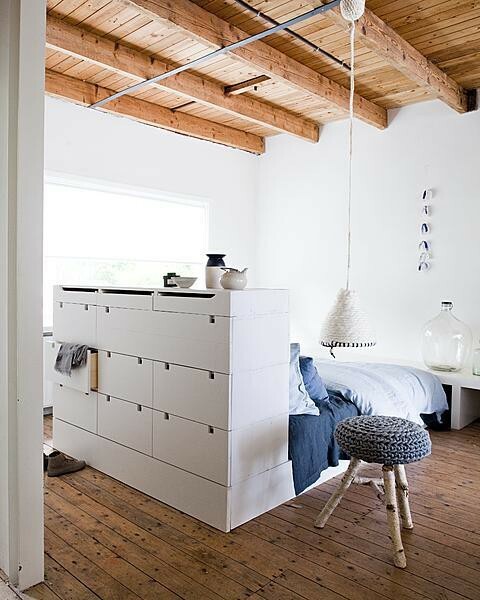 This headboard storage unit from Ikea is pretty genius. 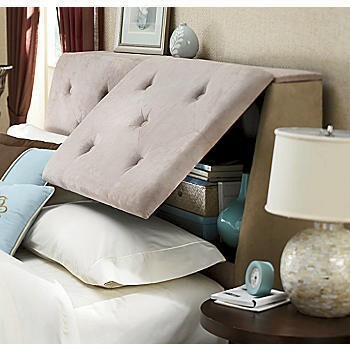 The shelves roll away behind the clean and simple headboard so that any clutter is hidden away, easy as that! It’s a great-looking piece, and not expensive either. 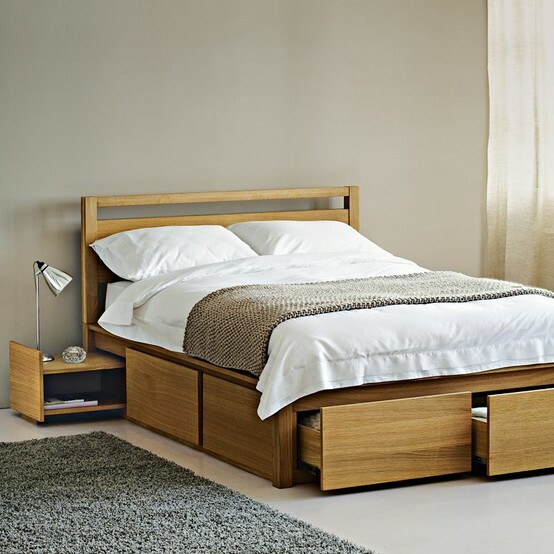 This style of bed is great for incorporating a huge amount of storage. 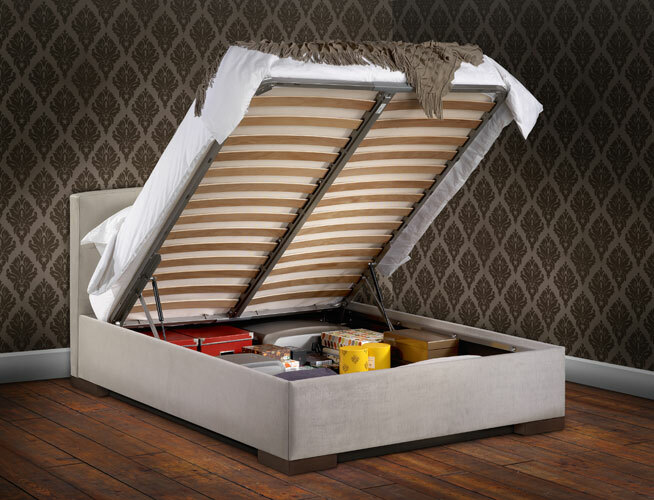 The ones from The Storage Bed Company are up to 35 cm deep and you get a ton of space! Just make sure you don’t go nuts and just chuck a pile of stuff under there – bins and separators are key for keeping your new-found storage area tidy, accessible and functional. Tags: bed frame, bedroom furniture, captain's bed, de-clutter, divan bed, drawers, guest bed, headboard storage, interior design, kids bedroom, Organization, Storage, under bed. Bookmark the permalink.